iPhoto enables you to send pictures via email... sort of. As long as you use Mac Mail, Entourage, AOL, or Eudora, and realize that you can't send directly from iPhoto; it just opens your email app for you. And none of this helps all of those Gmail users out there. Good news though. Thanks to Juan Ignacio Leon, Gmail fans can download iPhoto2Gmail and send pictures directly from iPhoto without ever opening their email client. 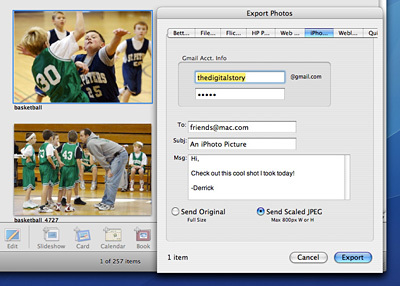 iPhoto2Gmail is an export plug-in that you access via File -> Export. All you have to do is select your picture(s) in iPhoto, open iPhoto2Gmail via Export, address your letter, and click the Export button. Your images will immediately be delivered via your Gmail account. Currently you have the option to send full size pictures or scale them down to 800 pixels. But Juan says he'll have more resizing options in the next release. Plus, he's also working on integrating Gmail Contacts into the plug-in. Hopefully we'll see the new version before long. In the meantime, you can download iPhoto2Gmail today and start sharing pictures. The application is donationware. So if you like it, please put a few bucks in the jar. You get a lot of camera for under $200 with either of these new models. 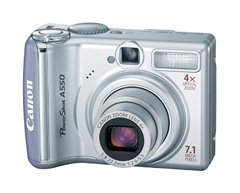 The A550 is a 7.1 megapixel compact with a 4x optical zoom lens and a 2-inch LCD screen. It has a DIGIC II processor under the hood and tons of features. Suggested retail will be $199 US. The new PowerShot A460 digital camera features 5.0 megapixel resolution with a 4x optical zoom lens and a 2-inch LCD screen, up from 4.0 megapixels and a 1.8-inch LCD screen on last year's PowerShot A430 model. It also uses the DIGIC II processor, and will retail for $149 US. You can get more information from the official Canon press release. But based on the specs, stellar track record of this line of cameras, and competitive pricing, these cameras should be very popular. Interesting Article: "To Delete or Not, That Is the Question..."
I was happy to find a thoughtful weblog post on one of my favorite subjeccts: At what point do you delete your undesirable images? In his post, To Delete or Not, That Is the Question..., Carl Weese says, "To me it seems prudent to avoid deletion in camera. I also reformat the memory card in-camera, after downloading and making two copies of all the files on either hard drives or optical media. Call it belt'n'suspenders." Carl discusses additional reasons not to be too delete-happy, even once the images have been loaded on to the computer and examined on the monitor. My personal view on this is to only delete the outright unusable dogs and archive the marginal stuff. A slightly underexposed, badly composed image of Uncle Bob might not mean much today, but 10 years from now could be a valuable, touching memory. 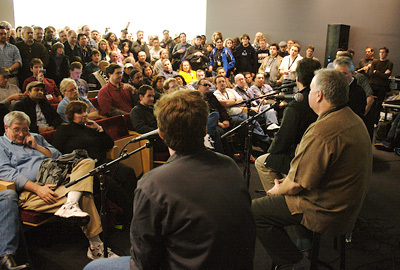 A terrific group of podcasters congregated at the Apple Store on Thursday, Jan. 11 to discuss nearly every facet of this popular medium. I was lucky enough to join the panel that included Adam Christianson, Leo Laporte, Alex Lindsay, Scott Bourne, Merlin Mann, Andy Ihnatko, and many more. You can listen to that discussion by downloading the Podcaster Meetup on the Maccast web site. On a separate podcasting note, the Digital Story episode that typically runs on Tuesdays will be delayed until Thursday. But it will be worth the wait. I have an interview with the incredible Colleen Wheeler who gives us an inside look at photography book publishing and discusses her work with famous photographers such as Stephen Johnson, Mikkel Aaland, Eddie Tapp and more. It's a terrific conversation that I'm sure you'll enjoy... but you have to wait until Thursday. Macworld 2007 was about digital media -- photography, video, and yes, tons of audio. We saw Apple TV officially introduced at the Steve Jobs keynote, a brief solo performance by John Mayer, live podcasts such as MacBreak Weekly and the iLifeZone, and a special podcaster meetup at the Apple Store. I was participating in many of these events and brought along my trusty Canon Rebel XT to capture a few close-up glimpses. I had a decent seat for the Jobs keynote (being on the conference faculty), and sat-in on the MacBreak show and the podcaster meetup. I've posted the gallery here with the accompanying metadata for you to enjoy. 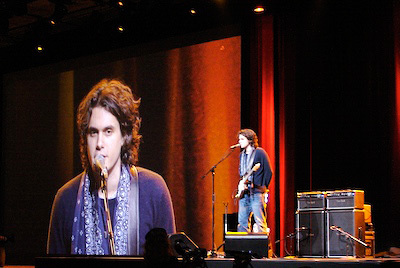 Picture: John Mayer performing at the Steve Jobs keynote. Photo by Derrick Story. Nikon was proudly demoing the Universal Binary version of Capture NX at Macworld this week. This latest version provides minor enhancements and bug fixes, but most importantly it runs an the new Intel versions of Macs. Rob Galbraith reports that "in the brief demonstration we saw, the speed at which the program could render a D2X NEF as it opened was dramatically faster than the current PowerPC version of the program on the same machine." He also wrote: "Also new in the upcoming Capture NX update are larger histogram and Curves/Levels palettes, as well as various bug fixes and performance enhancements, says Nikon USA's Mike Rubin. A ship date hasn't been set for the new version of Capture NX, nor is the company revealing what the version number will be. 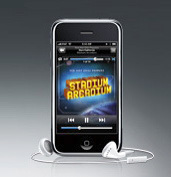 When it's released it will be a free, downloadable update for licensed users. The update will be to both the Mac and Windows versions of the application." You can read the entire Nikon press release on Ron's site. This is great news for Nikon shooters who capture in Raw and work on Macs. One of the things that David Pogue commented on yesterday (David being one of the few living beings outside of Apple to operate the new iPhone) was how marvelous the LCD screen was on the iPhone. He said that when you use the 2-megpixel camera and look at the world though that screen, it was as big and open as anything he's seen on a consumer camera. Given that you can transfer those images easily via email, the Web, and other online tools via iPhone, this is one of the most "connected" cameras in the world -- WiFi, Edge, Bluetooth. Casio has found a way to squeeze a 7X optical zoom in a pocketable 7.2 megapixel beauty. 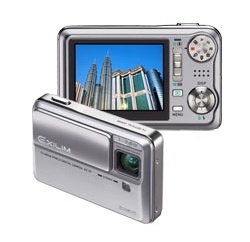 The just-announced EXILIM Hi-Zoom EX-V7 also features blur reduction technologies with the new CCD shift system, the redesigned EXILIM Engine 2.0 image processor, and now captures movies with H.264 encoding (which should be QuickTime compatible right out of the camera). Casio is showing off the camera at the CES show in Las Vegas, NV. It will retail for $399 or less when available in March. This is a compact to keep our eyes on as the hands-on reviews begin to surface. Boinx Software has released a public beta of the redesigned FotoMagico to garner user feedback before making the final version available. Major improvements in 2.0 include the ability to create a standalone player for your presentations, watermark capability, fresh user interface, and performance enhancements. Oliver Breidenbach of Boinx Software comments, "FotoMagico 2 enters the Public Beta testing phase. 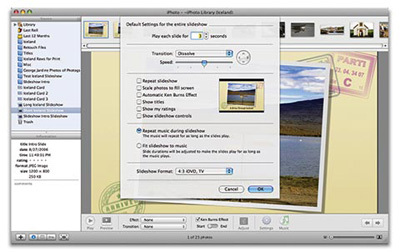 FotoMagico 2 represents a significant step forward by introducing high resolution, standalone slideshow players that can be shared with people who do not have a license for FotoMagico. 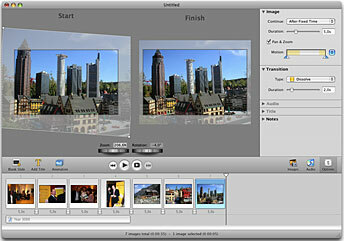 In order to test this new capability thoroughly, FotoMagico 2 is now available as a public beta with a final release planned for March, 2007." You can download the public beta today and give it a spin. Be sure to let Boinx know what you like and what needs improvement. iPhoto's slideshow authoring tools have come a long way since the early days of the application. You can author very good presentations without ever leaving your digital shoebox... that is if you know a few tricks. In a recent article I wrote for Macworld Magazine titled, Create stunning slide shows, I show many of the techniques that I've perfected over the years to create terrific presentations with my iPhoto images. If you're an iPhoto user, you might want to give it a read.